Devon Monk has written the Allie Beckstrom series. Allie Beckstrom is one of many strong urban fantasy women. What she has that makes her different from everyone else is Devon Monk. 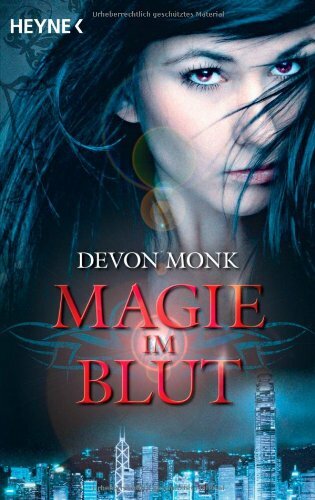 Devon Monk is an excellent urban fantasy author. Her writing is delightful and the entertainment value of the books is high. Humor, action, magic and some romance are all ingredients of this series. I see that the series is recommended for ages 18 and up, but am not really certain why. Maybe I’m too Norwegian??? Allie lives in a Portland where magic has become something anyone can use. But magic extracts a price – memory loss, pain or sickness. If you do not want to pay the price, there are actually people who are willing to do so – for a sum. Allie’s father is Daniel Beckstrom, the inventor of the rods that attract magic, drawing it away from buildings and into wells beneath the city. He and she do not get along, partly due to her choice of career. You see, Allie is a Hound, someone who hunts magic abusers through smell. In Magic in the Bone Allie has to hunt for someone who is using blood-magic. All the evidence is pointing right to her father as thee perpetrator. This throws Allie into a world of corporate espionage and black magic. Devon Monk does an excellent job of introducing the reader to Allie’s universe. This is high quality entertainment. Excellent write-up. I absolutely appreciate this site. Keep it up!